Graphic Designer at Univ. de Chile. 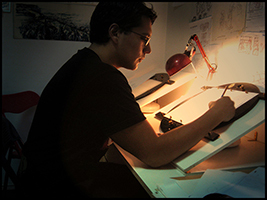 Associate Degree in Arts (Drawing) from Pontifical Catholic University of Chile Professional Illustrator since 2007, I worked in Videogames, Comics, Trading Card Games, Advertising, etc. Essentially, I like to illustrate, I love works in Fantasy Illustrations, Comics and Games, Character and Visual development etc. The most important things for me is to achieve good results in the areas of drawing, composition, concepts, color and technique, I’m always studying and trying to get better, so I like better my next illustration than the previous one.